A pretty, sunny day in a rose garden is the focal point of this landscape painting by the famous artist Camille Pissarro (1830-1903). 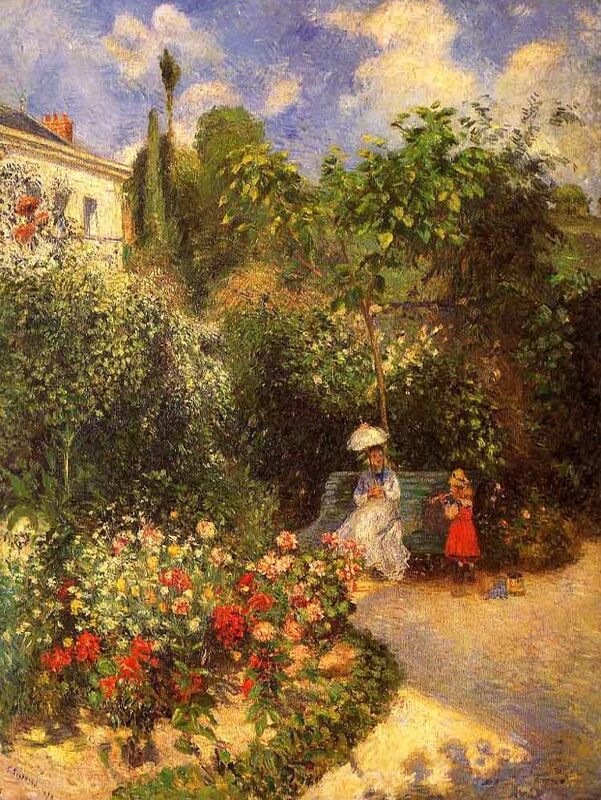 Pissarro turned this impressionist landscape painting into something much more interesting than a simple painting of a flower garden by including a little girl in a red dress, surrounded by her toys and playing a toy horn for a lady nearby. The lady, dressed in a lacy white dress, sits under her parasol on a park bench enjoying the lush garden, the sunshine and hopefully the serenade. I couldn’t find anything specific about this painting other than it was painted in 1877. Apparently the artist completed several landscapes which he entitled similarly. I can’t help but wonder if the little girl in the painting might be his own daughter Jeanne and if the lady might be his wife Julie. Pontoise is located just northwest of Paris. You can learn more about the artist, his life and his work by visiting our Camille Pissarro biography.